1/9/2019 - (Excerpt) - The Department of Education (ED) released guidance on the verification process on Wednesday that would decrease the burden on students, families, and financial aid administrators and ensure easier access to federal financial aid. In an electronic announcement, ED wrote that it would allow copies of tax returns and written statements of non-filing to be accepted for verification purposes in lieu of obtaining IRS tax return transcripts and verification of non-filing (VONF) forms for both the 2018-19 and 2019-20 application years. This guidance is effective for all verifications conducted on or after January 9, 2019, regardless of FAFSA processing date. Year-Round Pell allows students to receive up to 150% of a regular grant award over the course of the academic year so that they can continue taking classes in the summer and finish their degrees faster than they would otherwise. This additional 50% requires that you be at least half-time and this usage goes toward the 600% LEU. The IRS DRT is available to use with the 2018-19 FAFSA form. Additional security and privacy protections have been added to address concerns that data from the tool could be used by identity thieves to file fraudulent tax returns. The IRS DRT will not return for the 2017-2018 form. The IRS DRT remains the fastest, most accurate way to input your tax return information into the FAFSA form. Also, if you filed an amended tax return, you now may be eligible to use the IRS DRT. Although the IRS DRT is unavailable to use when completing the 2017‒18 FAFSA form, you can still apply at fafsa.gov and manually enter your tax return information. Remember: The 2017–18 FAFSA form requires your 2015 tax data. Got your tax return or transcript in hand, and not sure what goes where on the FAFSA form? 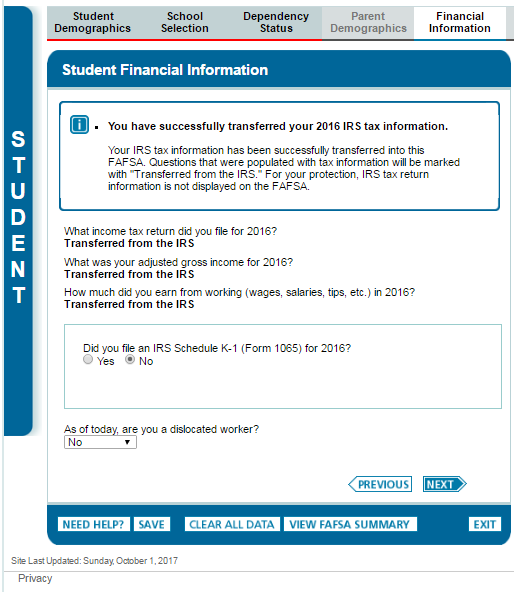 You can still fill out the FAFSA form without access to the IRS DRT. Once you’ve filled out your Free Application for Federal Student Aid (FAFSA) form and received your grant , loan, or work-study funds to help you pay for college or career school, make sure you stay eligible throughout the academic year—and in subsequent years. Spring 2019 Commencement: Congratulations Seahawks! Transfer Orientation and Advising: Welcome Transfer Students!